A leaked federal climate science report reveals how serious the impacts of climate change have already been in the US and will give Trump and his administration a new headache. The 673-page report was prepared by 50 leading scientists from 13 federal agencies – including the National Oceanic and Atmospheric Administration (NOAA) and the National Aeronautics and Space Administration (NASA) – and assesses the “state of science relating to climate change and its physical impacts”. The report details how climate change is affecting weather and climate across the United States and concludes that “it is extremely likely that human influence has been the dominant cause of the observed warming since the mid-20th century”. It leaves little room to manoeuvre for agenda-driven climate science deniers that wish to continue to curtail global action to mitigate climate change. 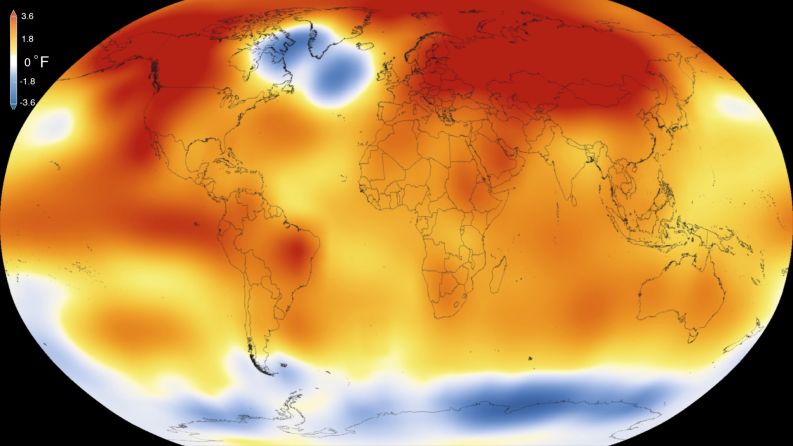 “For the warming over the past century, there is no convincing alternative explanation supported by the extent of the observational evidence,” the report states. The report highlights what changes the world’s scientists have directly measured over the past 150 years or so. Global mean carbon dioxide concentrations have surpassed 400 parts per million, a level that last occurred 3 million years ago. In line with increasing carbon dioxide levels, temperatures have increased by an average of 1.0°C between 1901 and 2016. In fact, 16 of the past 17 years have been the warmest since temperatures record using thermometers began. Ocean surface water temperatures have also increased, by 0.7°C since 1901 and Arctic sea ice has rapidly declined in recent decades. Melting polar ice sheets and glaciers have caused global mean sea level to rise by 16 to 21 centimetres since 1901 – 7 cm of which has occurred since 1993, while the world’s oceans have absorbed over one-quarter of carbon dioxide emitted by humans, our oceans are now more acidic. Natural events such as El Niño events, solar activity and volcanic eruptions have contributed to seasonal and yearly variation in weather, but contribute only “a small fraction of observed climate trends over decades”, the report finds. The report focused on temperature, rainfall, snowpack, flooding and drought data over more than 100 years for ten regions across the United States (including Alaska, Hawaii and the Caribbean). In line with global trends, the US has warmed by an average of 0.7 degrees Celsius since the start of the 20th century, and numerous recording-breaking temperatures have been set and broken in recent years, particularly in the western half of continental US. Alaska has warmed twice as fast as the global average over the past 50 years and this has resulted in widespread melting of glaciers and permafrost. When it comes to the greatest temperature changes, it is urban areas – particularly in humid regions in the eastern US – that are experiencing the highest daytime and nighttime temperatures. Heavy precipitation has increased in frequency and severity in the Midwest and Northeast, with daily precipitation up by as much 29 per cent compared to 1901. While the extremes of heat and drought have not surpassed the infamous Dust Bowl period of the 1930’s, heat waves and drought have increased in frequency and severity since the 1960’s in the western and southeastern US. Forest fires have also become much more common in the western US and Alaska since the 1980’s. The number of severe tidal floods has also increased five to tenfold in several US cities since the 1960’s. The authors of the report agree with the vast majority of the global scientific community that, through our own activities, humans are conducting an “unprecedented experiment” with the climate system. Much of the knowledge of the physical basis of climate change was well established by the 1960’s and since then climate records are more detailed and climate models have become more sophisticated. For the US, models predict that wet areas will get wetter, dry areas will get drier and that the frequency and duration of extreme weather events will increase. While powerful climate denial groups have hindered climate action, the scientific evidence has never been stronger and it is clear that the window of opportunity is slim. The report stresses further that we may be approaching “critical threshold or tipping point events” that would have “abrupt and/or irreversible” consequences. This report, which forms part of the National Climate Assessment and is mandated by US Congress, is at odds with the rhetoric used and actions taken by the Trump administration over the past few months. One thing is for sure, the leak of this draft means that the world’s scientists and concerned citizens are watching out for their next move.